Each year, fire departments respond to an average of 210 structure fires caused by Christmas trees. Carefully decorating Christmas trees can help make your holidays safer. 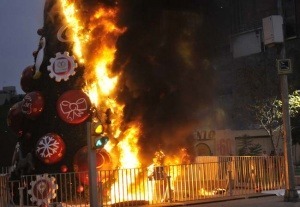 – If you have an artificial tree, be sure it is labeled, certified, or identified by the manufacturer as fire retardant. – Choose a tree with fresh, green needles that do not fall off when touched. – Before placing the tree in the stand, cut 1″ – 2″ from the base of the trunk. – Make sure the tree is at least three feet away from any heat source, like fireplaces, radiators, candles, heat vents or lights. – Make sure the tree is not blocking an exit. – Add water to the tree stand. Be sure to add water daily. – Use lights that have the label of an independent testing laboratory. Some lights are only for indoor or outdoor use, but not both. – Replace any string of lights with worn or broken cords or loose bulb connections. Connect no more than three strands of mini string sets and a maximum of 50 bulbs for screw-in bulbs. Read manufacturer’s instructions for number of LED strands to connect. – Never use lit candles to decorate the tree. – Always turn off Christmas tree lights before leaving home or going to bed. – Get rid of the tree when it begins dropping needles. Dried-out trees are a fire danger and should not be left in the home or garage, or placed outside against the home. Check with your local community to find a recycling program. Bring outdoor electrical lights inside after the holidays to prevent hazards and make them last longer.